Anthony Jermaine Mills (ZIN | Wali Aqueel) was born January 29, 1973 at Evans Army Hospital in Fort Carson, CO. After residing in Colorado Springs, CO, the family moved to Denver in the spring of 1973. Anthony was a happy, lively child. He lit up every room he entered and continued to have the same beautiful spirit into adulthood. After graduating high school, Anthony moved to Texas to attend college at Prairie View A&M University and later Texas Southern University. While in Texas, Anthony gained knowledge of self, spiritually and adopted the name Wali Aqueel to reflect that knowledge. Additionally, Anthony’s artistic talents in music, poetry and community activism blossomed, giving birth to his professional name, ZIN. For more than 17 years, ZIN was a fixture in Houston’s socially conscious radio, music and art scene. He is remembered as the pioneer of Mahogany Café’s “House of Words” in historic Third Ward Houston and a member of the Hip Hop group, the NOMADS. Over the years, ZIN released multiple conscious hip-hop albums which include, ‘Y2K Compliant’, ‘Seeds of Survival’, ‘Mental Graffiti, ‘Lightbox Chronicles’ and ‘Pedal Passion’. In 2005, ZIN established his own radio program on KPFT 90.1 FM, S.O.S. Radio after his successful and ground-breaking KPFT show, Damage Control. 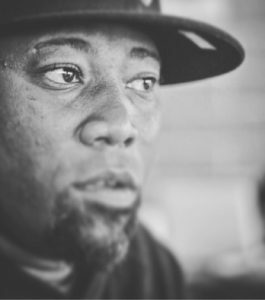 ZIN’s work in music provided him the opportunity to collaborate with and interview numerous artists such as, Black Eyed Peas, Dead Prez, Public Enemy, X-Clan, Erykah Badu, Gil Scot Heron, Talib Kweli, Stephen Marley, Sunni Patterson and Jill Scott. ZIN was also a strong community activist, organizing efforts such as Operation Clean Hood to instill community pride. Another example of his commitment to the community was his determination to report directly from the Houston Astrodome following the Hurricane Katrina tragedy. After 10 years with KPFT, ZIN launched his own 24 hour, Internet radio station, All Real Radio (ARR) in June 2014 on the grounds of the historic Third Ward Project Row Houses. All Real Radio was well received by both the public and the artist community. Notable artists and guests include, David Banner, Jasiri X and Les Nubians. On January 3, 2016, ZIN made his transition in Denver, CO, after succumbing to his injuries from a car accident. Anthony is survived by his wife Ciandra, two daughters Journey, Senait, father Preston Mills, siblings Angela and Don Mills and many family members and dear friends. Anthony | ZIN | Wali Aqueel, stood out in the community as a passionate, persistent, professional, conscious artist, community servant, writer, producer, journalist, emcee, father, brother, son and husband.